Broadway was once not so broad – or straight. Prior to1931 it had been a tree-lined, residential street of more modest proportions. 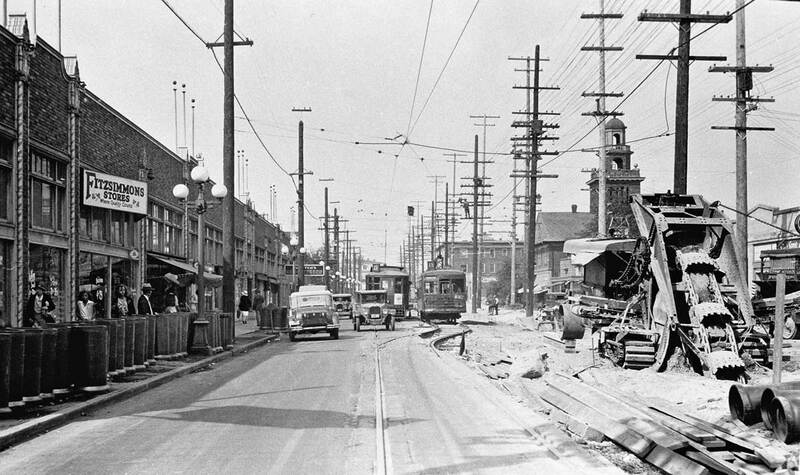 On August 25, 1931, a photographer from the city’s Public Works department recorded the three historical photos featured here. All look north on Broadway from its intersection with Harrison Street. The top most of the three was photographed from some lofty station – probably the scoop steam shovel used in laying a sewerage line down what would then soon be the center of Broadway. 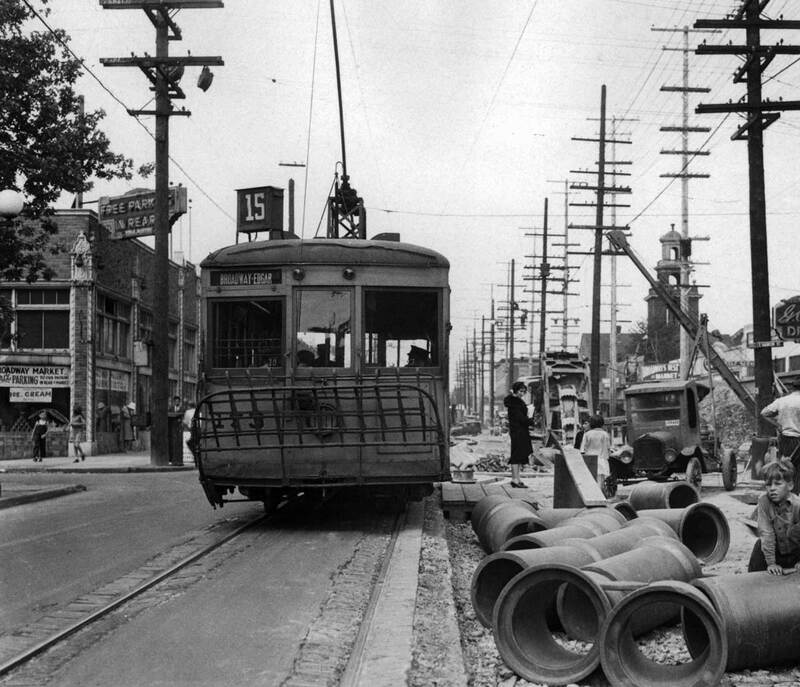 The line of power poles, right-of-center, mark the old east side of Broadway. They would soon come down and the work of putting up new ones at the new sidewalk has begun. The one-story business buildings in this block, with only a few exceptions, were new and are the same as those now standing. Most of the buildings on the right side were purposely built back from the old curb, preparing for the street to spread. The long building on the left of all three scenes is the Broadway Market. For 30 years it served as a block-long collection of independently owned small shops under one roof including a creamery, florist, two delis, a fish market, beauty salon, two meat markets, two bakeries and Norm’s Café, a favorite neighborhood hang-out. I remember it as a Marketime Store in the 1970s, and since then has been remodeled into an arcade with QFC the primary tenant. Fred and Kitty White, who moved into one of the only two houses on the east side of this block in 1904, ran what was apparently the first business on this Capitol Hill section of Broadway. They had brought with them from Iowa two Jersey cows and sold cream to their Broadway district neighbors. The daughter, Frances (who was still living in Seattle in 1984 when this feature was first composed) remembers dodging bicycles and electric trolleys to cross the street on her deliveries. 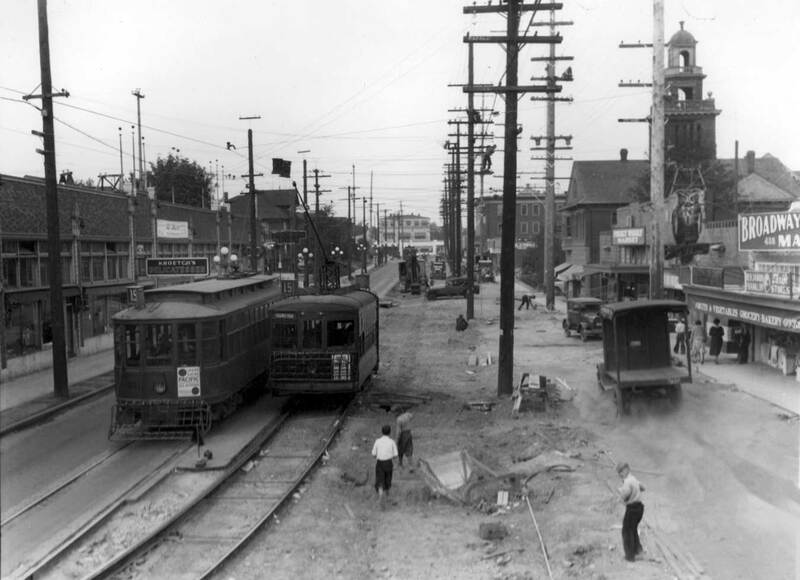 The trolleys had been running there since the early 1890s when they first cut through the forest on their way to City Park (now Volunteer Park) and Lakeview Cemetery. The tower in the upper right hand corner is attached to the Pilgrim Congregational Church. Dedicated in 1906, it was the first church in the neighborhood. With the widening of Broadway, the church lost a part of its front lawn. The tower of the church rises above and behind the long roof of a large frame “box” with peaked roof at the southeast corner of Broadway and Republican. The sidewalk level was commercial with living quarters upstairs. Through the last years of its service before it was razed in 1977 the sidewalk storefront housed Peters on Broadway, which, if memory serves, was the first “outed” gay clothier on Capitol Hill. For many years the large two-story apartment upstairs (reached by a narrow stairway at the rear off of Republican,) was handed down from one Cornish faculty member and/or student to another. I lived in that apartment from late 1975 until the building was destroyed. I taught filmmaking at Cornish for a spell in the 1970s. One of my roommates, Norman Langill, founded the One Reel Vaudeville Show in 1972, and was then producing campy northwest vaudeville from the side of a 1931 Model A truck with a fold-down stage. By now the “Vaudeville Show” part of the group’s name is rarely heard. Among its other “big shows,” One Reel has been directing the Bumbershoot Festival since the early 1980s. As a New Yorker, in 1961 I moved to Seattle and worked in the art departments of Frederick & Nelson.. I’d watched the construction of the Monorail and rode it to my job selling tickets at the 1962 World’s Fair. I hiked Mt. Rainier and Mt. Baker with the Mountaineers, while living in a lovely hotel apartment on Pike St. Would love to see photos of the time.